Hs2 to Crewe and Manchester. Where’s the opposition? It’s now the best part of a week since the Hs2 Phase 2a Hybrid Bill sailed past its 2nd reading in the House of Commons by 295 votes to 12. I’ve been crunching the numbers on the latest Stophs2 petition so I thought I’d take a look to see if this has galvanised opposition to Hs2 along the Manchester route. The answer is – anything but. Here’s a spreadsheet examining signatures to the petition allocated by constituency. I’ve data going back to November but this snapshot goes back to a few days before the bill had its 2nd reading – along with totals for December and January. The first five constituencies on the list are on the Phase 2 a route and the numbers are lousy, the ‘best’ (Lichfield) has only just managed to get over a third of one percent. It’s slightly behind the overall best which is Tatton with a measly 0.35% of constituents. The petition’s doomed of course, but it does provide an interesting snapshot of feelings along the route and provides an indicator of where the ‘active’ Stophs2 action groups are. They’re few and far between – and nothing in the Greater Manchester area at all. 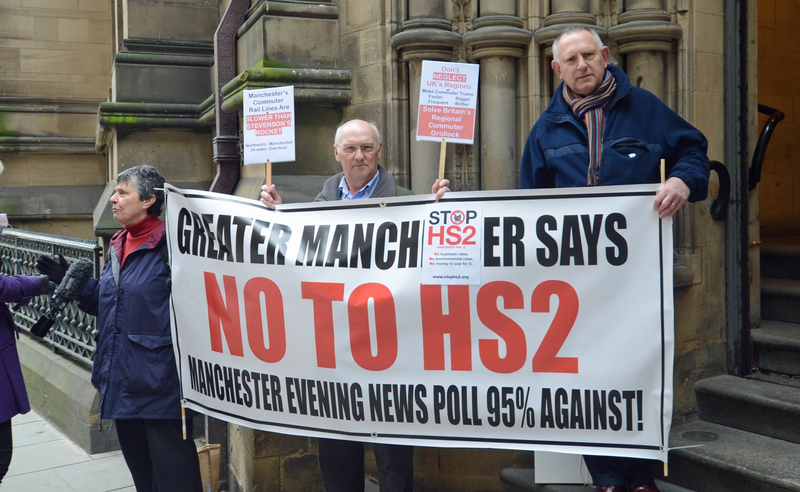 Here’s what passes for an active group – Mid Cheshire against Hs2 (link). Don’t bother clicking on the ‘events’ section of their website ‘cos there’s nothing there! It’s the same with their Facebook page. Googling them doesn’t reveal any activity either other than moaning to newspapers! Meanwhile, what of the MPs along the route? Well, of the five phase 2a MPs, only two (Bill Cash & Michael Fabricant) voted against the Phase 2a bill, two abstained and one – Tamworth’s Christopher Pincher voted yes. The 13 MPs on the rest of the route abstained! I’ll be monitoring the petition result to the bitter end in order to mine the data and judge the strength of the opposition to Hs2 but on current results it’s fair to say it’s ineffectual. The next data of interest will be the number of petitions posted on phase 2a. Unlike on phase 1 there’s no groups trying to canvas petitions or issuing templates for people to follow, so the results are likely to be very different. Of course, the template petitions were a waste of time as they were grouped together! Now that the national anti Hs2 campaign’s collapsed, the local groups are increasingly isolated. Their ability to lobby MPs is both limited and ineffective as Hs2 continues to enjoy cross-party support and has the backing of most regional political and business leaders, especially in the metropolitan areas. I expect that support to grow as more and more Hs2 construction contracts are let and firms recruit staff and place orders for equipment. 2018 is going to be a very interesting year for Hs2 – if not for its opponents! “Two funds, worth £40 million, are now open for bids: the Community and Environment Fund (CEF) and the Business and Local Economy Fund (BLEF). The CEF will help enhance community facilities, improve access to the countryside and conserve the natural environment, while the BLEF will support local economies in areas where businesses may experience disruption from the construction of HS2. The CEF and BLEF together make up £40 million and will be allocated at a regional level: £15 million for the central area (Staffordshire, Warwickshire, Buckinghamshire Northamptonshire, Oxfordshire and Hertfordshire), £7.5 million for Greater London and £7.5 million for the West Midlands (Birmingham, Solihull and Coventry). The remaining £10 million will fund cross-border or route wide projects”. That’s a total of £70m for projects along the phase 1 route that have been released by Royal Assent. Of course, RA has had other impacts. It’s screwed down the lid on the StopHs2 campaign’s coffin. Their campaign’s dead – although some of them refuse to admit it and continue to witter on Twitter, as if it matters any more as spades will start going into the ground in a few short weeks time. So, what’s next for the anti Hs2 campaign. Well, on phase 1 – it’s oblivion. There’s only one active group left in 2017 as Hs2aa haven’t been heard of since November last year. In fact, if you look at Hs2aa’s website you wouldn’t even know Hs2 has got Royal Assent! That leaves Kenilworth based StopHs2 which is just two people. Joe Rukin (who lives locally) and Penny Gaines, who’s decamped to the South-West! In order to keep his non-job going poor Joe is trying to sell his services and ‘expertise’ to Phase 2 campaigners. Quite what Yorkshire would do with a bloke whose CV reveals 7 years of failure and dishonesty is an interesting question. StopHs2 are skint. How long they will survive now is an interesting question. I’d be surprised if they last beyond the summer. That brings us onto the next phase of Hs2 – 2a from the W Midlands to Crewe. The consultation closed on 7th November 2016. Shortly afterwards the Govt confirmed the route. 2017 will see the Environmental Impact Assessment completed and the Hybrid Bill launched. The Govt are expecting phase 2a to get Royal Assent in 2019. This may seem optimistic when you look at the time it took on Phase 1, but for one thing. The anti Hs2 campaign on Phase 2a is almost non-existent! Apart from an active group around Stone (Staffs), supported by the local MP, Bill Cash, there’s no organised opposition to Hs2. There was in the past (of a sort, anyway) but it was always riven by in-fighting and egos. Much of it was UKIP inspired, but as they’ve got their own problems nowadays don’t expect many fireworks. That leaves the two arms of phase 2. Crewe to Manchester and the W Midlands to Leeds. Of the two, the Manchester arm has the least Stophs2 activity. There’s a small group based in Mid-Cheshire that’s noisy but ineffective (it doesn’t even have the backing of the local MP) and there’s the remnants of a group around Warrington. Take a look at their website. It hasn’t been updated since 2015! Their Facebook page isn’t much better. The only other group worth mentioning is CADRAG (Culcheth And District Rail Action Group) but they’re just as moribund as the others. This comment on their Facebook page says it all. That leaves the Leeds leg, where the story is more complicated. There’s one tiny group in Leics (which essentially seems to be a one man and his dog operation) around the village of Measham. Here’s their website. When you look through you find there’s very little in the way of action. Much of their website is empty and they’ve still not announced who their Committee members are 3 months on! Their main reason to exist seems to be to help people turn out carbon copy consultation responses (which worked so well on Phase 1 , not). Their social media presence is one man tweeting stuff that has no links with Measham at all, just random StopHs2 propaganda, oh, and a strange obsession with how many views his Tweets have had (so much so that he then tweets about it)! A telling statistic is that only 1% of the local population turned up to their inaugural meeting. What makes this group interesting is that they’re like a few on the Yorkshire arm. They only exist because the route was changed after consultations. That means there’s opposition to their position as the changes were so that Hs2 affects less people. We may yet find the rug is pulled from under groups like this if the new consultations show a majority of local support FOR the changes! It’s the same with a few small groups North of Sheffield. There’s an added problem for anti Hs2 campaigners here as they command very little political support. Whilst Yorkshire political culture is renowned for factionalism and squabbling between the different Councils, local Authorities and metropolitan areas the overwhelming majority of Yorkshire politicians see Hs2 as a good thing even if they can’t agree on the final course of the route. But then, neither can the protesters! There’s no coherent voice or anti Hs2 campaign across Yorkshire. The anti campaign is also hamstrung by the fact that – unlike the Chiltern Nimbys, they can’t use the excuse that there’s no stations and they don’t directly benefit. What Yorkshire does have is a cadre of academics and vested interests centred around Leeds/Harrogate who are anti Hs2. In the case of High Speed UK (HSUK) that’s because they have their own pet scheme they want to make some money out of. 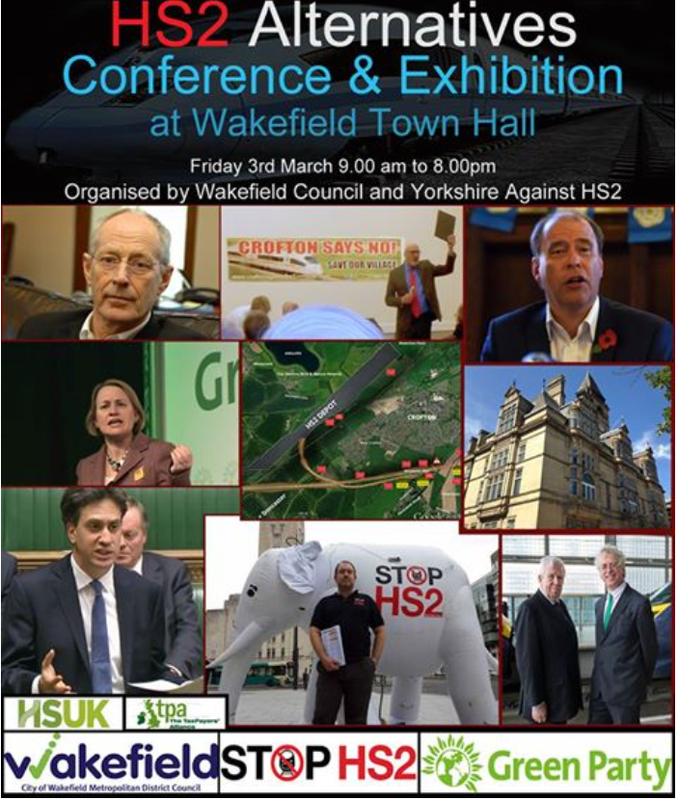 In conjunction with Wakefield Council (one of the political awkward squad, through its leader, Cllr Peter Box) a group grandly styling themselves “Yorkshire Against HS2” have organised a conference tomorrow. Titled “Hs2 Alternatives”. It contained the usual rag-bag of long term opponents and political dogmatists, from lobbyists like the Taxpayers Alliance to the Green party’s Natalie “brain fade” Bennett. Add to the mix HSUK (still punting their back of a fag packet ‘alternative’) and the superbly bonkers Paul Withrington, (who styles himself ‘Transport Watch’), StopHs2’s Joe Rukin and local self publicist Cllr Gibbons and you’ve got a real treat! I doubt Yorkshire’s seen a box of frogs this mad since the UKIP conference was last in the county. Quite wisely, two local MPs (Ed Miliband and Jon Tricket) are keeping their distance and (allegedly) leaving messages via a video link! And that it! The phase 2 Hybrid Bill won’t be along for a couple of years yet, so expect a lot of what’s left of the opposition to drop away – just as it did on phase 1. In the meantime, construction will have started on phase 1 and the phase 2a Hybrid Bill will be attracting all the attention. Now I’m looking forward to a few years spent blogging about progress on the construction of Hs2! I haven’t blogged about the Stop hs2 campaign for some time, mostly because it’s a busted flush nowadays, but I thought it would be useful to sum up the state of play in the final weeks before Phase 1 gets Royal Assent. Ever since Hs2 passed 2nd reading in the Commons with such a stonking majority the antis campaign has been doomed. From that point on there was a noticeable decline in their efforts which has continued ever since. Now they’re doing a very good impression of the fabled Oozlum bird! The final straw for many of them was the fact the Lords Hs2 Committee made it very clear they weren’t going to tolerate the campaign trying to bog down progress on the bill by sticking in hundreds of pointless petitions. The Committee also severely limited what one of the remaining anti Hs2 groups (Hs2aa) could petition about. Meanwhile, the Stophs2 group is hanging on by the skin of its teeth despite the fact it’s a pointless organization with little to do. Like Hs2aa, its website is mostly kept alive by repeating what the media are saying about Hs2 or recycling old articles from the past, otherwise there’s nothing happening. The days of meetings, conventions and organising protests are long gone. This year they’ve not even attended any of the party conferences, so we’ve been saved from the usual fairy stories about how ‘busy’ their stall was – which is always contradicted by people tweeting pictures of it! What’s instructive is taking a look at their Facebook page. On it you’ll find the same few names constantly expressing their bewilderment. They simply can’t understand why Hs2 is still happening. However, when you read through the comments and see the sheer level of ignorance about transport, economics and politics being expressed – you can see why they failed. The comments are overwhelmingly from those living on the route howling in incomprehension at everything. Their unguarded comments make it clear most of them have given up the fight, all they’re doing now is moaning about the result. So, where do things go from here? It’s clear the stop Hs2 campaign’s been a miserable failure. Tactically it’s been a disaster. It never understood that a few hundred people affected by a specific issue like Hs2 would struggle to get wider public support. Pretending some negative opinion polls would somehow translate into anything concrete was a huge mistake – as was incessently painting politicians (the very people they needed) as corrupt. Trotting out a constant stream of lies, deception and dodgy figures wasn’t too bright either. The anti Hs2 campaign was probably the first major one of the social media age, so it holds a lot of lessons for others. What it’s taught us is that social media is very much a double-edged sword for such campaigns because it exposes your weaknesses just as much as it allows you to get your message across to people. Social media has allowed us to see that the stophs2 campaign was actually a tiny group of people that was shrinking as time went on. It also showed that many of its ‘supporters’ were opportunists from the economic right wing such as the Taxpayers Alliance and the Institute for Economic Affairs, plus UKIP. We can see from Facebook that their campaign stalled years ago. It’s never attracted more than a few thousand people at most. Only a tiny percentage of that few thousand are in any way activists. Twitter paints an even worse picture as it’s clear from the activity surrounding the #hs2 hashtag that there’s been a massive drop in people tweeting anti H2 messages. To make matters worse, the majority of those remaining are either from the political fruitcake end of the spectrum or are tweeting anonymously (which is a complete waste of time). That leaves a handful of ordinary people. As a campaigning tool to stop hs2 it’s useless. Instead, what it has done is expose another of their weaknesses – which is that apart from their ‘heartland’ in the Chilterns, they’re scattered and isolated. The phase 1 campaign is effectively dead. Royal Assent (which is only a few weeks away) is now certain. The last hope for their campaign was that the reconstituted Tory government would have a change of heart after Brexit. That hope was dashed when it became clear that Teresa May, her new Chancellor and Transport Minister strongly backed hs2. Added to this was the delicious irony that the brexit vote made building Hs2 crucial to the Governments efforts to boost the economy. So much for UKIP (who claimed Hs2 was a dastardly EU plot that was imposed on us) support for the antis! Once phase 1 gets Royal Assent Hs2aa (which is almost exclusively made up of Chiltern Nimbys) is redundant, as is Warwickshire based & funded Stophs2. I can’t see either of them surviving into 2017, which leaves the stop hs2 campaign without any national leadership or structure. Now the ‘battle’ moves on to phase 2 and phase 2a. So, what’s the state of play on those sections of the route? Phase 2a to Crewe passes through Staffordshire where the anti Hs2 campaign’s always been a bit of a joke. They’ve spent more time fighting each other than trying to stop hs2 due to the egos and ‘personalities’ involved. Think of Monty Python’s ‘Life of Brian’ and the ‘splitters’ of the Judean Peoples front…Right now there’s not even an established group in Staffs to oppose phase 2a. UKIP support featured heavily in Staffs, but now that party is in decline there’s little to suggest there’s ever going to be coherent opposition to Phase 2a. Phase 2 is a little more complex. The leg from Crewe to Manchester and the spur to the WCML near Warrington has very little opposition apart from a moribund group of Nimbys in Mid-Cheshire and another around Warrington. What’s significant is that there’s not a single organised StopHs2 group anywhere in the Manchester area. The other leg through Sheffield to Leeds has more opposition due to the recent route change. That said, there’s little that’s coherent. Leeds has a tiny and disorganised group in the outskirts to the South-East. There was a group at Church Fenton, but again, that’s done very little. There is new opposition centred around Rotherham but they seem hell-bent on running a carbon-copy of the failed phase 1 campaign. Instead of concentrating their efforts on route changes or mitigation they’re wasting their time trying to stop the whole Hs2 project. The problem all these groups have is political support for Hs2 is far stronger in the North than it was in the South. Even though some Yorkshire MPs like Ed Miliband have expressed opposition to the route change, they still support building Hs2. This means there’s no chance that there will be a rebellion of MPs to vote down the Hs2 Phase 2 Hybrid Bill when it gets to Parliament. Of course, all this is several years away but what is increasingly clear is that Stophs2 as a national campaign is finished. The anti Hs2 campaign has always tried to pretend more folks support it than really do. More often than not the media swallow their nonsense & talk about the ‘strong’ opposition to Hs2. The daft thing is, it only takes a few minutes research for these ridiculous claims to be exposed – mostly by the anti Hs2 campaigners themselves! Here’s a great example. Step forward the ‘Mid Cheshire Against Hs2’ group. Regular readers will know about this bunch already, but for those not familiar with them, allow me to elucidate. The Mid Cheshire group are one of only a handful of anti groups on the whole of the phase 2 route (both East to Leeds & West to Manchester). Famously, a few of them turned up at Sir David Higgins ‘Hs2 plus’ launch in Manchester where they pretended to be from the city. That’s because, embarrassingly for the anti Hs2 campaign – there’s not a single anti group in the whole of the city or larger Greater Manchester area of some 2.7 million souls! Here they are in all their ‘glory’..
Whilst they were there one of them was interviewed by the Manchester Evening News & made the laughable claim that the anti Hs2 campaign was bigger than the opposition to Margaret Thatcher’s poll tax. I kid you not! Here’s the MEN article. Next time you hear certain sections of the media churn out the same lazy nonsense about ‘strong opposition’ to Hs2, feel free to point them in the direction of this blog. Not long after I published this blog and exposed the derisory turn out at the AGM, the minutes mysteriously disappeared from their website. Funny, that. None have ever appeared since. I wonder why?